By the time most sequels reach their third installment, typically even the best series has been stripped of any surprise and originality it might have had in the first place. Even the third Star Wars was somewhat of a letdown. Such is not the case, though, with this new game. When I reviewed its two prequels, I declared them to be light-years beyond any previous fantasy games. What is truly surprising is that Phantasie III is light-years beyond its two landmark predecessors. I hardly need to go into the specifics of play. Phantasie III continues the storyline begun in I & II, basically a rich blend of dungeons and dragons, swords and sorcery. Nikademus is still on the run, still spreading his own special brand of evil. And you are again pursuing him. Or, rather, your characters are. A number of characters can be created, each randomly assigned attribute values increasing in direct proportion to the warriors' strength, intelligence, charisma, luck, dexterity and constitution. Up to six are then banded into a group, armed and trained and put on the road to begin their (and your) adventure. Moving out of the town of Pendragon, you cross the countryside, battling scores of creatures in the forests and dungeons of the land, stopping at inns and towns to rest and build strength. Successful quests are rewarded with gold and experience points; unsuccessful ones are rewarded with death. The kingdom you explore is vast and full of dark dungeons and dangerous monsters, as well as a number of hidden worlds not immediately discovered. But rest assured that if you manage to explore all the nooks and crannies filling the data disk, you will meet the evasive Nikademus and battle him on his own turf. Of course, this climax is days (both real-time days and game-time days) away. But it won't take any time at all to learn the simple, intuitive commands you use to control your destiny. The mouse is used for nearly all input, which is done on carefully designed and efficient displays, containing logical defaults to speed repetitive selections. For example, when creating a character it is assumed that you will continue to create characters of the same race and profession until you choose otherwise. Very useful, as you might discard scores of fighters until you get one with randomly assigned attribute values that satisfy you. Nearly all screen displays have been redesigned, adding more detail, color and action. The status of your band is displayed at all times, graphically, on the screen. Each member's body is displayed with wounds indicated as to body part and degree of injury. A red, broken left arm can render a character incapable of using his bow. A removed head can render a character incapable of even simpler tasks. The list of improvements continues. 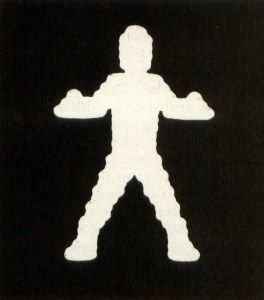 Party members can be assigned to ranks in the group. Placing your weaker wizards at the back protects them from the brute force of the melees. You can save more than one dungeon map, and your party can accumulate up to a billion gold pieces. You are allowed to distribute items upon entry into a town, and trade items among party members, rectifying a clumsy fault in the two earlier Phantasies. A couple of more spells have been added, as well as the ability to target spells at specific ranks. Bows are added as a weapon, and you can selectively increase a character's nine skills by specific training as he rises in level. You have more control over the destiny of your characters. The documentation is equally superb. The 25-page manual completely describes all aspects of game play and program operation. Tables and charts simplify determining the allowable spells and strengths of the various creatures inhabiting the Phantasie universe. Two handy appendices provide impatient players with quick start information and veterans with a list of the enhancements contained in III. An ST reference card contains machine-specific information, which I felt was a little brief, but adequate overall. In fact, this game is so close to perfect, I have to dig really deep to find any fault. But here goes. While I liked the ability to copy both game and data disks, the required input of answers to questions on the manual's contents multiple times during a play session was distracting—even after we had memorized all the questions. 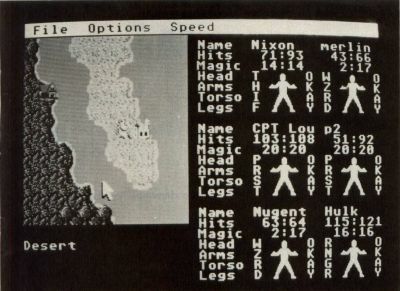 In the prior two versions, upon casting a spell, menus listing the available spells for each character indicated those spells which were not available due to weakness. In III you must try to use the spell only to be told your character is too weak. Menu windows open up over the status display, making it difficult and time consuming to administer healing spells and magic potions to a weary group, as you often must exit the routine in order to check the status of your men. Finally, although you are able to transfer your characters from I & II to III, I was unable to do so with my loyal group, who had finished both of the previous adventures. The transfer program worked perfectly with other data disks, just not with the one I wanted to use. However, we simply recreated our warriors and played despite the annoyance. So, if you can't tell by now, I'll make it known: I loved this game. Phantasie III skillfully mixes a great story line filled with plenty of action and adventure, a number of improvements and a user interface second to none. As a stand-alone game, or the climax to the series, it is a must for all adventurers. I can only hope that we will get to experience more Phantastic games like this one.